As much as the book of Esther was about the story of Queen Esther, the relevance of Mordecai in this entire plot can never be overlooked. In a nutshell, Esther has been taken to the King’s harem, gained his favour and the favor of everybody who saw her, and was made Queen. Concerned about her, her cousin Mordecai, who brought her up, sat by the king’s gate daily to hear about her news [Esther 2:11]. When Haman, a nobleman of the king’s court, was honored and everybody had to kneel down to him, Mordecai refused to, and Haman bore a grudge against Mordecai, and plotted to destroy hi people, the Jews. With his influence, an edict was sent out with the order to destroy, kill and annihilate all the Jews [Esther 3:13]. Mordecai, in his desperation, turned to Esther to save their people, but she explained that nobody, not even the Queen, can approach the king without being summoned, and if anybody does so, that person will be put to death unless specially granted grace by the King [Esther 4:11]. In verses 13-14, Mordecai’s answer showed the importance of his belief in God’s sovereignty and God’s deliverance. Much have been touted about Esther’s role in the great twist of events in kingdom of Xerxes regarding the Jews, and without taking away due credit to Esther, I would like to focus on the role of Mordecai in this entire episode. 1. He raised Esther – and therefore must be considered to be rather influential to Esther [Esther 2:20]. 3. He uncovered a conspiracy to kill the king – Because he was so concerned about Esther, and therefore because he was always at the king’s gate, he managed to uncover a conspiracy [Esther 2:21], which he wasn’t honored or rewarded for initially – but, with amazing timing that we can perhaps only exclaim to be divine – was honored for it when Haman was about to ask the King to hang Mordecai [Esther 6:11]. 5. He challenged Esther into an act of sacrifice – Perhaps his most important role in the events of the book of Esther was his plea to Esther, the essence of which can be found in Esther 4:13-14. These verses not only show the extent of his belief in the sovereignty of God, but also the extent of his faith in the promise of God’s deliverance to his people. 6. His happy ending – Haman was hung on the gallows that he had built for Mordecai, and Mordecai was promoted to Haman’s high position, becoming prominent, powerful and reputable [Esther 9:4]. The Jews were not only saved, but also granted protection from the King, which freed them from persecution and racial prejudice that they had faced earlier. If there was never Haman’s plot to destroy the Jews, there wouldn’t be an opportunity for the Jews to turn the tables – they would likely still be prejudiced against and bullied. For if you remain silent at this time – Ordinary folks like me will perhaps not understand the gravity of the tension in a palace. There’s a saying that to accompany a ruler is like accompanying a tiger – you never know when it will pounce on you. Esther has the precedence of Queen Vashti as a vivid example of the reality of her situation – what wrong did Vashti do? All she did was refuse to go the one of the king’s banquet, and look at how she ended up. Who knows, she could have been feeling unwell; or she could have been feeling like she was not up to task of entertaining the king’s nobles. But there was no chance to defend herself; there was no second chance at all. That is the power of a ruler, the power of a king – in the land of laws, he has the authority to take your life as he wished. 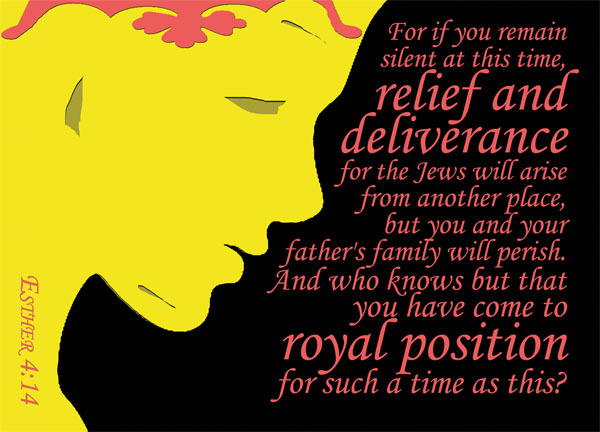 Queen Esther lived a cautious life in the palace following Mordecai’s instruction to not reveal her family background and her identity as a Jew. To suddenly ask her to speak out for the Jews was a big call. Did Mordecai not know that by refusing to bow to Haman, he would incur his wrath? Yet he never bowed to Haman. Did it never once occur to him that his life may be threatened if he do not bow down to a powerful figure like Haman? While it wasn’t as simple for Haman to take his life than it was for the King, Haman had great influence at that time. Mordecai knew very well what he was doing, at the risk of his life. He likely never expected his refusal to submit to Haman would involve his entire race – but at the risk of his own life he did what was pleasing to the Lord. It was perhaps in this perspective that Mordecai challenged Esther to act. relief and deliverance for the Jews will arise from another place – Mordecai was likely knowledgeable in the prophetic scriptures, and believed that God would not allow his people to be destroyed before his will on them was fulfilled, and therefore he kept faith in the promises of deliverance with such certainty. If not by the means of Esther, then surely, by some other means or some other Jews, the deliverance of the Jews will be granted. This was some big words to utter at a critical time in the history of the Jews – how dare he, Mordecai, who was the catalyst for the crisis in the first place, still utter such confident words? The edict has already been sent! His entire race would be exterminated because he refused to bow down to one, measly Haman! But such was Mordecai’s unwavering spirit. Such was his belief in God’s deliverance. but you and your father’s family will perish – if Esther remained silent, and Haman’s evil plans are fulfilled, surely Esther won’t be let off even in the safety of the palace, being a Jew, and will perish together with her people. If Esther remain silent, and Haman’s evil plans fall through because of God’s deliverance from somewhere else, then surely the vengeance of God will boil against Esther and her family, who refused to help out her people when at a position capable of doing so. If Esther did not remain silent, and got killed for her audacity to breach into the king’s inner chambers, then she will die. The last scenario is, if she did not remain silent, and succeeds in her plea to the King. In just a few words, Mordecai lays out the options available to Esther. If the chance of you dying is so high, why not take the risk and die doing good, instead of die doing nothing for your people? Why not take the risk, and trust in the Lord? And who knows but that you have come to royal position for such a time as this? – Indeed, how unusual it was for a Jew, who were always prejudiced against, to become a Queen of Persia? What kind of coincidence is it that when her people are in trouble, she is in such a privileged position? Mordecai’s hunches were right – it was no coincidence, God placed her in that position for a reason. Like how God raised up the likes of Abraham, Moses and Joseph to bless and deliver the Israelites later on in their lives, so too did God raise up young Esther for the deliverance and the raising up of the Jews. It was with this belief that Mordecai urged Esther to take action for the sake of the Jews. He truly believed that Esther would escape the King’s wrath. He truly believed that she can be used by God to deliver the Jews. He wasn’t asking his cousin to sacrifice her life for the Jews because he had no other options. He wasn’t cruel. He cared for Esther – but he truly believed that she would be fine, and the Jews would be fine. As much as this book was named Esther, the role of Mordecai in the history of the Jews at that stage was crucial, and we can certainly learn a lot from his example. God raised Esther up, but had she chosen not to involve herself in the crisis of the Jews, perhaps this book wouldn’t be called the book of Esther, but something else. God may raise certain people up, but even if they end up choosing not to do God’s good works, God will simply raise other people up to do it, and the prophecies will still be fulfilled. I do not wish to diminish the importance of Esther – she was a young and intelligent woman that possessed great courage and faith – it says a lot to be one of the only two women to have a Biblical book named after you (the other being Ruth). But just for today, let us focus on the role that Mordecai played, and learn from his outstanding life and faith. He might not have been the main character; but if Esther did not have Mordecai, if Moses did not have Joshua and Hur, if Jesus did not have his disciples, if the apostles did not have their brothers and sisters in Christ, perhaps a lot of things would have been different. We may not be the main character of a story, but we have our own parts to play. Every single Jew in the Citadel of Susa who fasted and prayed for Queen Esther played their part. You and me, we too have our parts to play.